Lenovo has got a great thing going with its flexible Yoga series. A number of years ago, a good friend of mine felt the pull of hype and picked up an orange Yoga 2. He quickly fell in love, and likewise, I began to feel a little envious. Sure, the color was cool, but beyond that, the notebook had a lot going for it. A lot has changed in the four or so years since then, but the goals of the Yoga series has never changed. This 920, for example, is a 2-in-1, able to be used like a regular notebook, a tablet (or slate), a “stand” for movie or photo viewing, or as a tent – not for camping, but rather for presentations (or movies, if you prefer it over the stand mode). Before diving into the specifics of the exact model reviewed, here’s a shot of the special “Glass” edition. It boasts an identical hardware design, aside from the screen being strengthened with Corning Gorilla Glass. It also has a different aesthetic; silver all over with a neat design up top, it’s really sharp. To settle on the design it did, over 130 student proposals were submitted from Milan’s Istituto Europeo di Design. A panel of experts ultimately chose this one, “Vibes of Elegance” by Louis Aymonod, as it “conveys the dynamism of Yoga through simplicity and refinement”. I’ll buy that. Laptop hinges can be done well, but often, they rarely give you the impression that they’re going to hold for the long-run. The watch band style on the Yoga 920 is different, though, or it at least feels different. It’s sturdy, not loose whatsoever, yet it’s strong enough to allow you to use any angle you want to. When you’re using the notebook in tent mode, like seen below, there is no one size fits all. The angle could change simply based on how you’re sitting, so it’s nice to have this yoga-like flexibility. On the topic of flexibility, since this is a 2-in-1, the screen is of course touchable. More than that, it’s designed to be used by those who plan to do more than just draw circles (like me). The screen has 4096 levels of sensitivity, so if you want to draw or paint on your Yoga, nothing is stopping you. Well, aside from needing an optional pen, of course (Lenovo’s Active Pen 2 is the official choice). You’d guess right if you thought Wacom was behind this technology. This particular sample comes equipped with the base 256GB of NVMe storage, but it can be configured up to 1TB. Likewise, this notebook shipped with a 1080p panel, although a 4K panel can be opted for if you crave crispness. Just be warned that 4K means more GPU power draw, which in turn means reduced overall battery-life (10.8 hours vs. 15.5 hours, according to Lenovo). Another upgradable spec is the memory: this notebook includes 8GB, but it can be configured up to 16GB. 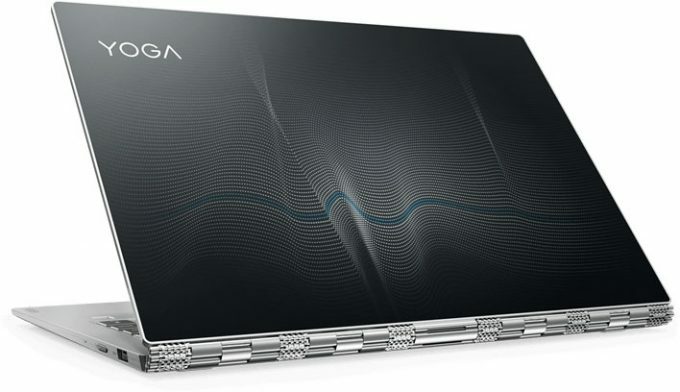 This Yoga 920 is 14-inches, although other sizes exist for other Yoga models. For a notebook half-an-inch thick, and weighing just three pounds, this one boasts some nice hardware. That includes the quad-core 8th-gen Intel processor, offering eight threads to help get jobs done quicker. 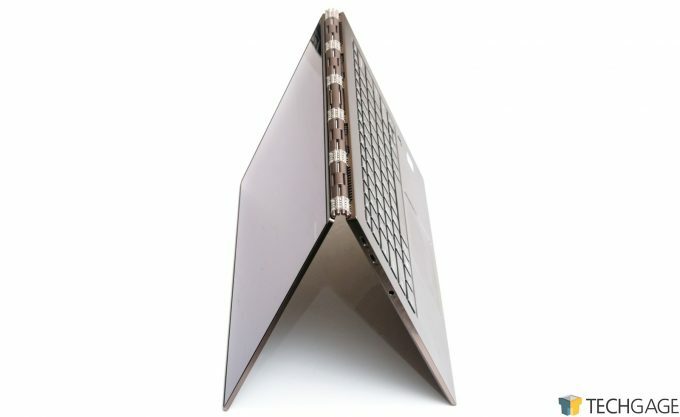 The Yoga 920 has a total of three USB ports, with one being the older-fashioned Type A style. The other two are both 40Gbps Thunderbolt ports that double as 5Gbps USB-C 3.0 ports. 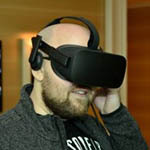 Beyond that, the other hardware around the sides include the audio jack (only output), and power button. If you look close near the power button, you’ll spot a pinhole, which is where the Novo recovery button hides. When the notebook is turned off, this button can be pushed in (with a paper clip or similarly pin-like object) and held for a few seconds to boot up into the Novo menu. From there, you can enter the BIOS, or begin with a system recovery. Being a 14-inch notebook, there’s only so much space to go around, so no numpad is found here (that’s typically found only on 15-inch and higher models). Lenovo made good use of the space it had here, offering a fairly spacious touchpad (it’s only really dwarfed by the MacBook’s). To the right of the touchpad is the finger print reader, which in my experience works well, but there is the occasion (1/8 times, I’d say) where I have to tap it a couple of times to get a response (which I’m thinking is more on Windows Hello than this reader). Certainly not on par with the nearly 100% accuracy I enjoy with my smartphone. Beyond all that, what’s not so obvious to spot around the notebook are the JBL speakers placed at the bottom (inside) of the hinge. These speakers offer room-filling sound that actually really impressed me. I tested with Reservoir Dogs and The Wire, and found the dialog to be very crisp and atmosphere quite detailed even with a lack of bass. And if you’re worried about loudness… you probably shouldn’t be. The keyboard on this notebook is one of the best I’ve personally used, feeling on par with what I’ve experienced with larger notebooks. On 13-inch and smaller notebooks, I have the tendency to typo a lott, but on this keyboard, I type naturally, and without worry. The only thing I miss is a numpad, but what can you expect for such a small form-factor? It might be worthy of note that the F1 – F12 keys have alternate functions that are made default thanks to the accompanying Lenovo software. That means that if you hit Alt + F4, you’re going to simply mute your mic. Fortunately, the software allows you to reverse the roles – although it might only matter for power users, more than someone who’s using a notebook to just get their work done.